Texas GunPowder is a world famous spice was very popular in the 90's until the founder of the company, Whit "Pappy" Pinnell, passed away. 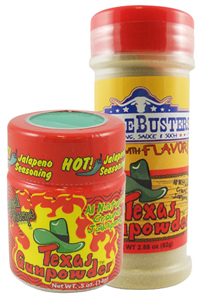 Mo Hotta Mo Betta is very proud to bring back Texas GunPowder in the original formula, pure ground jalapeno powder. Trust the Original when we say, there is only one original Texas GunPowder and this is it! My husband needed two bottles - he loves it on just about everything! Delicious hot flavors! Just a dash is all it takes. Too sweet, could not taste the herbs, and less spicy than "Texas Pete". On the same order as Asian sweet chili sauce. This is a product that is not TOO hot. I added Mo Hotta Mo Betta Jolokia rub to it for an extra kick. If you don't like a lot of heat it is perfect for you. Great taste!